Tiny Toones scholarships began in 2010 as a way to help students and staff at Tiny Toones reach their full potential. It is aimed at those who dream to receive an education but cannot due to lack of finances and lack of family support. Tiny Toones will assist those on a scholarship with the cost of their education including associated costs such as uniforms. Without this support, these students would not be able to afford to attend school. Each year the number of recipients grows, incuding for university and vocational training. However, due to lack of sufficient funds Tiny Toones must undertake this process slowly so that those currently on a scholarship can complete their course. Tiny Toones scholarships are a very important part of our work. 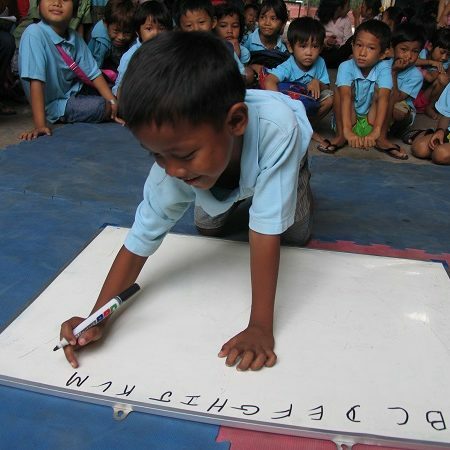 For many people around the world education is a right but in Cambodia it can be more of a dream for some. Providing support back into the public school system gives young people the opportunity to obtain a grade 12 certificate and with it, increased employment prospects. It also increases their confidence and self-worth. In 2011, three Tiny Toones former street kids began university on a scholarship. This was not only a big moment for those three, but for the their families and for Tiny Toones. They were the first of their families to receive a university education, begin to break their family’s poverty cycle, and challenge the ingrained Cambodian class structure. They have now completed their degrees and we are supporting other children and young people through their education.